The UN Security Council agreed Friday to extend the huge peacekeeping operation in the Democratic Republic of Congo until December to allow time for a withdrawal plan to be drawn up. The council unanimously adopted a French-drafted resolution that asked Secretary-General Antonio Guterres to present a strategic review no later than October on a "phased, progressive and comprehensive exit strategy." The move to draw down the mission known as MONUSCO followed presidential elections that ended Joseph Kabila's rule and raised prospects for stability in the vast mineral-rich country. 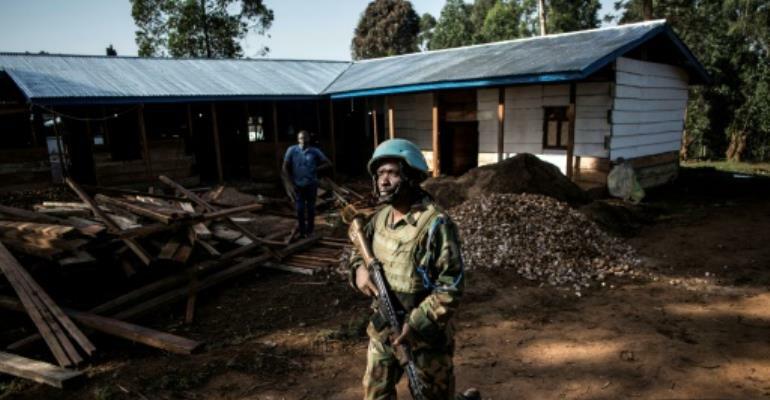 The 16,000-strong MONUSCO mission -- the UN's biggest and costliest with an annual budget of over $1 billion -- has been present in the DR Congo for 20 years, with a particular focus on the conflict-riven east. The council extended MONUSCO's mandate to December 20 and kept the troop ceiling unchanged, even though Guterres had proposed cuts in a report to the council earlier this month. Kabila had repeatedly called for the peacekeepers to leave and relations with the UN had soured by the end of his term, but his successor, Felix Tshisekedi, has offered to cooperate with the United Nations. While Tshisekedi has also called for a withdrawal plan, he has said the peacekeeping force must be "reduced and better armed and prepared" to fight the rebel and militia groups that wreak havoc in many parts of the country. Negotiations on an exit strategy come as the United States, the number one financial contributor to UN peacekeeping, is seeking to reduce its share of the UN budget for peace operations. The United States in December announced that it would cap its contribution to the peacekeeping budget to 25 percent, down from the current level of 28.5 percent. In the resolution, the council welcomed the peaceful holding of elections in the DR Congo but said it remained "deeply concerned by the persistent high levels of violence" and human rights violations. It also expressed "grave concern" at the recent outbreak of Ebola that has killed more than 600 people, and the growing number of Congolese displaced by conflict including 2.1 million in 2018 alone.